Take a look at the infographic. What do you see? What do you think? What do you wonder? Image from West Coast Shaving. Clicking on this image will show it expandable in a new window. Just click a second time on the image to expand it. 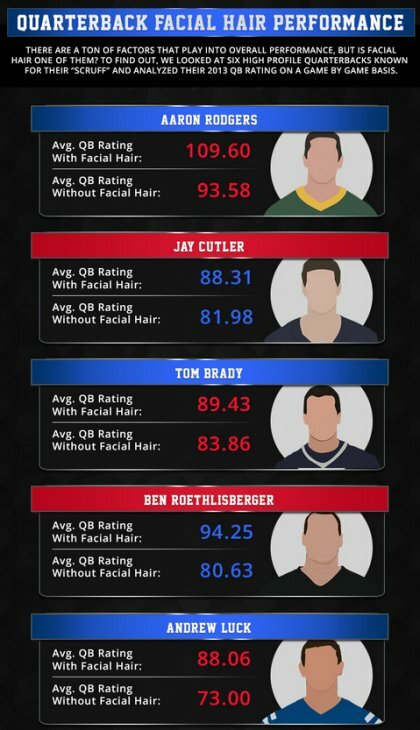 Is this enough data to definitively say that facial hair improves quarterback performance? How might we collect a stronger set of data? Does facial hair cause improved quarterback performance or is it a correlation? How can we collect data to show that facial hair reduces quarterback performance? Which measure of central tendency best represents the data? What type of graph or plot can be used to display the data? For members we have an editable Word docx, an Excel sheet of the data and graph, and solutions.